Oral cancer is one of the most deadly forms of cancer in America, affecting an estimated 43,250 men and women every year. Because its symptoms aren’t often evident until the disease has progressed to an advanced stage, oral cancer screening is an imperative component of successful diagnosis and treatment. At D’Amico & Mauck, DDS, Dr. Nicholas D’Amico and Dr. Matt Mauck provide patients in Aurora, CO and nearby areas with a comprehensive array of general dentistry services, including oral cancer screening. While it is true that certain activities – including smoking and excessive consumption of alcohol – do increase your risk for oral cancer, thousands of patients affected by the disease do not engage in these behaviors. 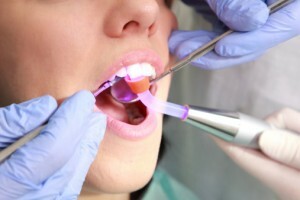 You may be in perfect physical health and still fall victim to this aggressive disease, which is why oral cancer screening at your general dentistry checkups is so important. Contact our office today to reserve your appointment with Drs. D’Amico and Mauck in Aurora, CO. Our experienced, caring doctors and team welcome entire families from throughout Aurora and the surrounding areas, including Parker, Denver, Centennial, Englewood, Denver Tech Center, and beyond. We look forward to becoming your trusted partners in your lifelong pursuit of optimal oral health.